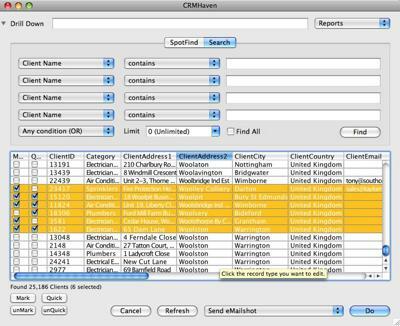 CRMHaven for Mac is a shared Address Book of contacts for Mac OS. Your Clients are shared (if you have multiple users in your groups) so any changes you make are immediately reflected on their computers. In business a Customer Management System is referred to as a CRM, thus the name CRMHaven. It refers to your contacts as Clients, but please note that these Clients can be anybody - friends, family, work contacts, sales contacts, school children..
CRMHaven is a shared Address Book of contacts (called Clients). ...... - friends, family, work contacts, sales contacts, school children, etc. People usually have three problems with address books. Getting your clients in, cleaning up this data and using your clients efficiently. CRMHaven for Mac lets you import from your Apple Address Book or a delimited file (tab or comma-separated). For cleaning your data there are dozen of changes to help update even thousands of clients quickly. You can now do lots with your clients including reporting, email, post, SMS, backup, custom client fields, send yourself reminders, track events such as appointments. CRMHaven for Mac, like the other HMS Cloud products, runs on Macintosh, Windows and Linux, so you can share your Client data with any other users world-wide. Qweas is providing links to CRMHaven for Mac 4.6 as a courtesy, and makes no representations regarding CRMHaven for Mac or any other applications or any information related thereto. Any questions, complaints or claims regarding this application CRMHaven for Mac 4.6 must be directed to the appropriate software vendor. You may click the publisher link of CRMHaven for Mac on the top of this page to get more details about the vendor.